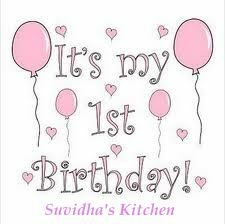 Happy Birthday to Suvidha’s Kitchen. It’s been a year today since the first post on this blog and today writing the 34th post gives me the immense pleasure. I was thinking of starting a blog for some time but was not getting motivated with its idea, then my niece started her blog “Smita’s Desk” which somehow inspired me to start this and from then onwards it has gathered 30 followers, 76 comments and few awards till date. Before Marriage I used to avoid cooking and in these 5 years I have started enjoying cooking and all the credit goes to my husband who has always supported me in this and every venture and praised even my worst cooking. Many Thanks to all my followers who have been there on the blog and have supported it even when I couldn’t write a post for 3-4 months in 2010 year end due to excessive travelling and out of net connections. I would also like to thank all the people who visited my blog and left a constructive comment on all my posts. It was really encouraging to see people coming in and leaving their valued feedback. I have been away from the blog for some time in between and couldn’t write posts. I wished that my first blog birthday post to be the 50th post but somehow couldn’t manage to do it but today i promise to compensate that in the coming year and hope to celebrate the second birthday with the 100th post. On this first birthday, I would like to introduce something new in this blog. As this is a recipe blog, I am adding some different ways of decorating salad plates. I am going to attach some snaps of my salad plates which are very easy to make and doesn’t need any explanation on how to make it, but will give various ways on presenting the salad. Many friends contact me personally and appreciate the blog but the right way to appreciate a blogger is to leave a comment or even better to become a follower if you really like it. I would request all my visitors to leave me a comment on the posts they like much or less. I would like to especially thank people for commenting one of my post “Tomato Penne Pasta” which alone gathered 26 comments and inspired me to do my best. Thank you again to all the regular readers of Suvidha’s Kitchen and lookout for my next post which will start a new feature “Salad Decoration” adding a feather to its cap. Keep writing and updating ! more salad pics will really be fun ! Happy B'Day bloggie......enjoyed all delicious dishes around year!! 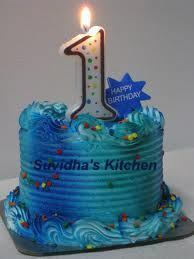 Congrats on your milestone, Suvidha! Good luck and cheers on your future goals!